Rain fell hard most of yesterday and last night. The previous week we had temperatures in the low 90s, but for the past 18 hours the outside has been down in 60s. It’s a nice relief, and we opened the windows (the ones that weren’t facing the rain) to let in some cool air. For part of this rainy day I sat out on the covered porch, watched the leaves on the Japanese maple Saint Vitus in the pelting; watched the bigger silver maple crack and break in the wind. 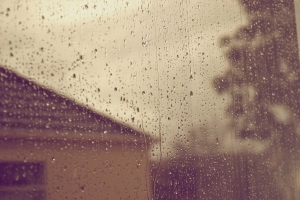 I love watching rain. I can be easily distracted by it for hours. It’s been many years since my meteorology class in college, but I still have a pretty competent understanding of how storms work. That working knowledge of rain doesn’t take away from its mystery. In fact, it probably contributes to it. My favorite poems affect me in the same way—with a sense of wonder brought on by their mystery and their engineering. The mind needs to be engaged, and poetry’s mystery is one of the most engaging things I can find. That’s why I find the pedestrian response to poems, the “I just don’t get it” response, so disheartening. Often, it’s the parts I don’t “get” that I like the best. So that begs the question—do we ruin poetry by solving its mysteries? I know it doesn’t rui n my garden to know a little about soil chemistry, that adding eggshells to the soil can prevent calcium deficiencies in my tomatoes. Does it ruin a poem to understand that a poet’s use of the caesura is there to slow down the mind’s ramble, that the poet’s use of the second person is a technique to engage me in a universal idea? I find satisfaction in knowing how poems work, and why in the same way I’m happy to not get lost in the woods. I can enjoy following blazes along a trail at the same time I find joy in not knowing—wonder at the animal that made that scratch mark or the fire that scorched that meadow. But is there a line between knowing and unknowing that some readers can’t cross? Probably there are lots of lines, and those vary from reader to reader, poem to poem. It varies based on one’s openness to wonder and unbalance. What happens when joy in unknowing turns to frustration, ambivalence and resentment? I think that’s where poetry ends, where doubt or displeasure takes over. We don’t like to be tricked, and too much mystery can be pretentious, or worse, hollow. Some of this probably explains why I like being outside more than anything, especially those places we call nature. However, I often take field guides with me. I may swoon at the sight of a large bird over a lake, but I like knowing its name. This may also explain my library of books on poetics. You can know how a thing works, and still appreciate the magic that it does. I try to make sure I leave myself open to some joy in mystery every day, and by that, I leave myself open to poetry. I find, usually in retrospect, that the times I’m most caught up in anxiety or stress, the details of negative distraction, that I’m less inclined to appreciate mystery. Those times (when work, life, finances… get in the way) I find it hard to write and hard even to read the things I love. We, or I, at least, need to remind myself daily of the vastness and wonder of the universe. Call it a prescription to relieve stress if you will. So, rain. Rain falling on my house; rain in the middle of the night; rain falling on a dark Pocono lake. Grant Clauser is the author of two poetry books, Necessary Myths (Broadkill River Press 2013) and The Trouble with Rivers (Foothills Publishing 2012). Poems have appeared in The American Poetry Review, Cheat River Review, Mason’s Road and others. He also writes about electronics, teaches poetry at Musehouse Writing Center and chases trout with a stick.